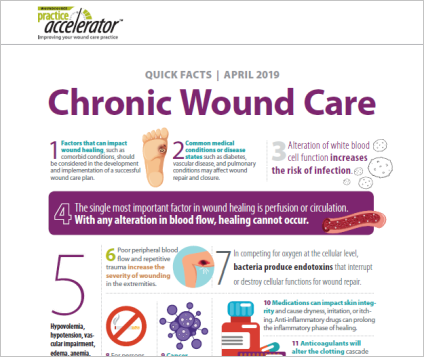 As part of the WoundSource Practice Accelerator series, we are offering you this educational portal into a variety of topics related to chronic wound identification and management. Managing chronic wounds and non-healing wounds present a significant clinical and economic challenge for clinicians. With limited resources, an increasing patient population with greater morbidities, rising health care costs, new regulations and increased scrutiny, health care providers must provide wound treatment to patients in an ever-changing and complex landscape of care. This webinar will provide clinicians with evidence-based knowledge on how to best diagnose and manage the chronic wounds that occur most frequently in today’s practice. Why Won’t This Wound Heal? When developing and implementing a wound care plan, health care professionals must look beyond predicted outcomes and the general processes of wound assessment, identification, and classification. This guide describes in detail the factors most commonly observed to affect wound healing. Careful consideration of these factors in treatment planning is an essential element of best practices in wound care. This two-page fact sheet was created to support staff education on managing chronic wounds. The print-friendly format is perfect for posting on the bulletin board or distributing to your nursing staff at in-service. How Much Do You Know About Managing Chronic Wounds? Wound healing takes place when a wound moves through the phases of wound healing: the inflammatory phase, proliferative phase, and maturation phase. This usually takes place over the course of a few days to a few weeks, but when a wound becomes stalled in on of the phases for more than 30 days it is considered a chronic wound. The most common types of chronic wounds are venous ulcers, arterial ulcers, diabetic foot ulcers, and pressure injuries. Chronic wounds impact over 6.5 million patients and cost over $26.8 billion in the US each year. Watch this brief overview video to learn more about chronic wounds and the educational resources made available on chronic wound management.